“How fortuitous”, I thought to myself, for that very morn I had come across a recipe that would suit that particular ingredient down to the ground. What I had in mind was Mini Meatloaf “Muffins” with a vegetable purée “frosting”. This idea was inspired by an article by Katie, aka the “Wellness Mama”, which can be found here. Place the minced venison in a large mixing bowl. Add the grated red onion, garlic, Herbes de Provence, smoked Spanish paprika, and almond flour. Mix well. Place in the fridge for an hour or so to let the flavours develop. Remove the bowl from the fridge, and allow to come up to room temperature. Mix in the egg with your hands, squishing and squashing the egg and mince together until they are very thoroughly mixed. Place some parchment liners in a muffin tin, and fill the liners with the meat mixture. Bake in the oven on the middle shelf until the tops of the “muffins” are nicely browned, about 30 minutes or so. In the meantime, cook the cauliflower. Drain well, and then purée with a hand held blender. Set aside. When the “muffins” are ready, remove them from the muffin tin, and serve them with the cauliflower “frosting” piped onto the top. We ate them with steamed asparagus dressed with lemon juice and olive oil. On the presentation side – here we used a “standard” sized muffin tin, rather than an “American” or “large” one, which meant that the meat came out shaped more like a slightly flattened, large meatball, rather than muffin-shaped. Our local supermarket sell very reasonably priced large silicon muffin-moulds, which might make for a better meat-muffin. Another slight niggle regarding the presentation – the cauliflower “frosting” was just a bit too runny to hold its shape once piped onto the top of the muffins, something that’s going to require a bit of further research. As far as the taste goes, we were more than happy there. Our one thought – the mildly gamey, almost lamb-like flavour of the venison mince might work slightly better with different herbs, spices and seasoning. The definitive Swedish go-to recipe book, “Vår Kokbok”, has quite a few recipes for venison, which might give us some interesting ideas on that front. 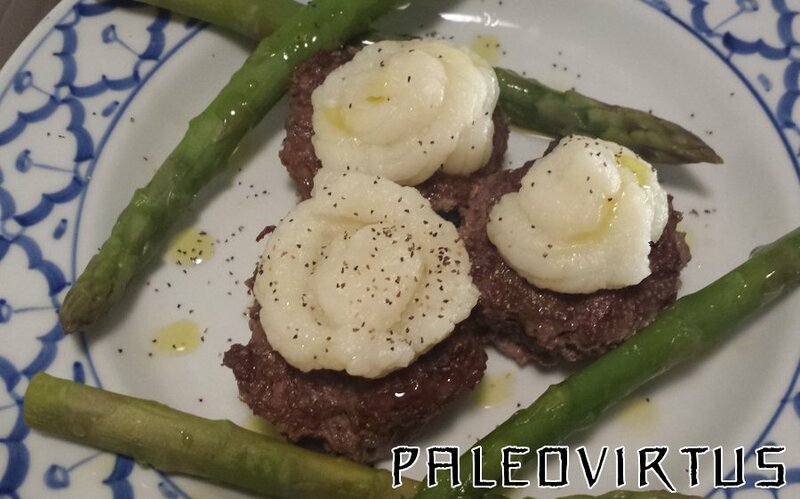 This entry was posted in Food Diary, Recipes and tagged asparagus, cauliflower, meat muffins, meatloaf, paleo, recipe, venison on September 30, 2014 by paleovirtus. This is my second attempt at a Lemon Pound Cake, following on from the Mk. I version, which I posted about here. As you may be able to tell, this version makes use of one half of the amount of almond flour, coconut flour, coconut oil, honey, and eggs that was in the Mk. I version. As per Mrs. Paleovirtus’ request to make the Mk. II version more lemony than the Mk. I version, I kept the original amount of lemon juice and zest, effectively making it twice as lemony as previously. This also had the effect of increasing the overall amount of liquid in the recipe, which in turn gave the cake mixture a less dense, compact texture (see notes below). Before attempting the Mk. II version, I did quite a bit of research into other Lemon Pound Cake recipes, both Paleo and non-Paleo, and came to the conclusion that the Mk. II version should contain vanilla essence for flavour, and baking powder to assist with the texture, which was one of the areas flagged for improvement after trying out the Mk. I recipe. To give a more pleasing shape I also bought a 450g / 1lb loaf tin. My research also suggested that I needed to bake the cake for a longer period of time in a slightly cooler oven – 1 hour in a 160° C oven. Pre-heat your oven to 160 deg. C.
Prepare a 450g / 1lb non-stick loaf tin by greasing it up well with coconut fat. Sift the 2 flours in a large mixing bowl. Mix well. If needs be, melt your coconut fat and honey in a microwave or over low heat. In a smaller bowl, mix the eggs, the lemon juice, and the lemon zest. Stir in the honey and the coconut oil. Mix well. Add the “wet” mix to the flours, and whisk together until you have a smooth cake mixture. Pour the cake mix into the loaf tin. Work it with a rubber spatula until you have a smooth, even layer. Bake for 1 hour or thereabouts, or until the cake passes the “clean-skewer” test for done-ness. Mrs. Paleovirtus felt that the amount of lemon in the Mk. II version was spot on, and flavour wise it only needed a wee bit more vanilla in order to make it perfect. The combined effect of the extra liquid, the baking powder, the new shape due to the loaf tin used, and the longer baking time in a cooler oven, greatly improved the texture of the Mk. II version. Due to the nature of almond and coconut flours, this is probably as good a texture as we can reasonably expect from such a cake, which is all well and good, as we’re very satisfied with it as it currently stands. 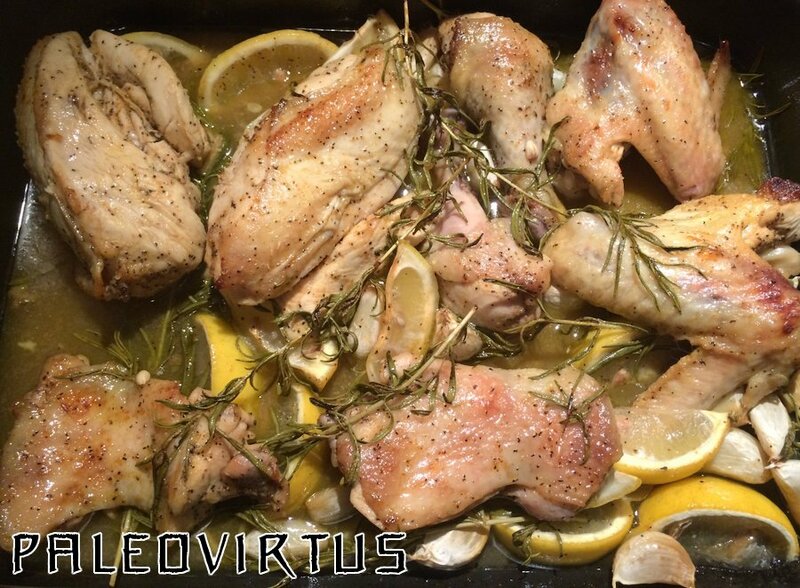 This entry was posted in Food Diary, Recipes and tagged baking, lemon pound cake, paleo on September 28, 2014 by paleovirtus. When I was out on my early morning bike-ride the other day I heard a commotion above me, and looking up saw what was for me the year’s first flock of geese calling it a day and heading off for warmer, Southern climes. They may be obnoxious, violent, feathered thugs, that leave little foul smelling nuggets of hatefulness all over the parks and playing fields of this fair city, but I’ll grant them one thing – they’re way ahead of us when it comes to matters connected to the weather and the seasons. We may have the fancy satellite networks, but they’re the little bar-stewards who know when the game’s up, and Autumn’s about to arrive with a bang. The end of summer does have its compensations, however. Firstly, as the weather turns colder and ever more damp, the hipsters and fair-weather casuals abandon their bicycles for their cars or a seat on a bus, and for the next 8 months the cycle lanes become a less populated and significantly safer place to ride. Secondly, all thoughts of summery salads and suchlike can be abandoned for the duration – let’s be honest, we’re all getting a bit sick of them by now, non? Stews and casseroles, and all those rich, meaty, earthy, herb-and-spice jacked autumnal flavours can once again be triumphantly wheeled out. In a fair world each municipality should hold an annual parade, complete with marching bands, fireworks, and speeches by civic dignitaries, as a giant, symbolic, slow-cooker wends its way through the city streets, to be showered with seasonal garlands by awe-struck civilians. Once again, though, it looks as though I’ll have to make do with a celebratory pot of Pu-Erh and a blueberry muffin. Hey ho. This dish is my first real nod this year to Autumnal flavours. 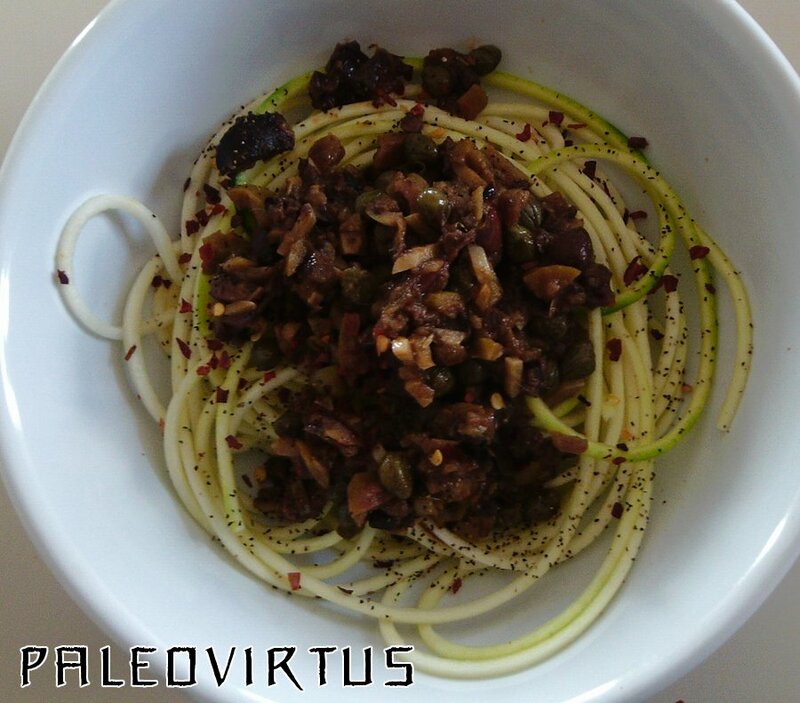 Mrs. Paleovirtus suggested something with pork, mushrooms, herbs, cabbage, and apples. Demanded, even. I was kind of up against it time-wise, so decided to do something based around minced pork. Bring the minced pork out of the fridge to come up to room temperature. Heat about 2 tbsp of olive oil in a non-stick frying pan over medium heat. Gently fry the cubed smoked bacon until it is just turning golden. Drain off the rendered bacon fat and olive oil, and set aside. In a large pan, add the rendered bacon fat and the olive oil, and return it to medium heat. Add the onion, and fry until soft, about 5 minutes or so. Add the garlic to the pan, and fry for a further 2 minutes. Add the juniper berries, Herbes de Provence, smoked Spanish paprika, and bay leaves to the pan. Mix well, and fry for a further 2 minutes or so, adding a splash of hot water if things threaten to stick. Add the pork mince, and stir well in, breaking up the mince with your wooden spoon. Stir fry until the mince has lost its raw colour, about 10 minutes or so. Add the apples, mushrooms, fried bacon, and Sauerkraut. Stir well. Add water to make enough of a sauce for everything to cook comfortably in. Return up to a low simmer. Simmer for about 30 minutes or so, until the pork is thoroughly cooked, and the apples are tender. Serve with steamed cauliflower on the side. 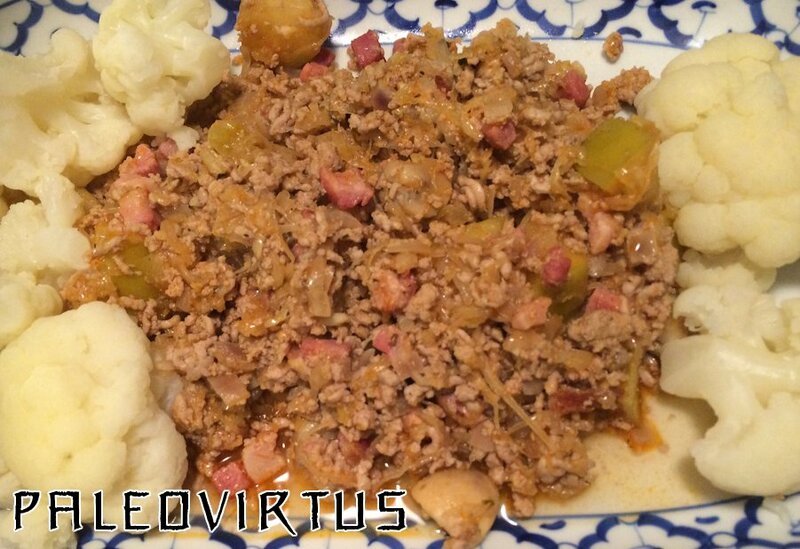 This entry was posted in Food Diary, Recipes and tagged apples, Autumn, mince, mushrooms, paleo, pork, recipe, Sauerkraut on September 26, 2014 by paleovirtus. Sometimes a recipe will appear in the various feeds you subscribe to, and you think to yourself that it sounds and looks great, but then the voice of the Disappointment Elf that constantly sits on the shoulder of the experienced cook and reminds you of failures past chirps up, and urges you to be cautious. “Two ingredient banana and coconut cookies”, he whispers, “sounds too good to be true, mate”. “But the photographs look so good“, I insist, “You can almost smell them, and the people posting in the comments seem to have made them work”. He never gets to finish the sentence, because the Go-For-It Gnome that sits on the other shoulder sucker punches him when he isn’t looking with a good old-fashioned right handed haymaker, and while he’s out cold insists that we have a crack at the new recipe. After all, what’s a banana and a bit of dessicated coconut in the grand scheme of things, eh? And so, mes amis, it came to pass that a few minutes later I was blitzing banana and dessicated coconut together into a cookie dough, forming them into diskettes, and throwing them into a pre-heated 180° C oven. Let it be noted that I got a 4 cookie yield from each batch of 1 banana and ¾ cup of dessicated coconut mixture. 25 minutes later they were out and cooling. The results were very encouraging. A first attempt at a new recipe is always a “proof of concept” job – you really should be keeping things as simple as possible to see if the base recipe itself actually works. I think the recipe itself cries out to be used as a starting point or base for experimentation – the next version will no doubt see the addition of honey, coco-powder (100%, of course), and quite possibly cinnamon. 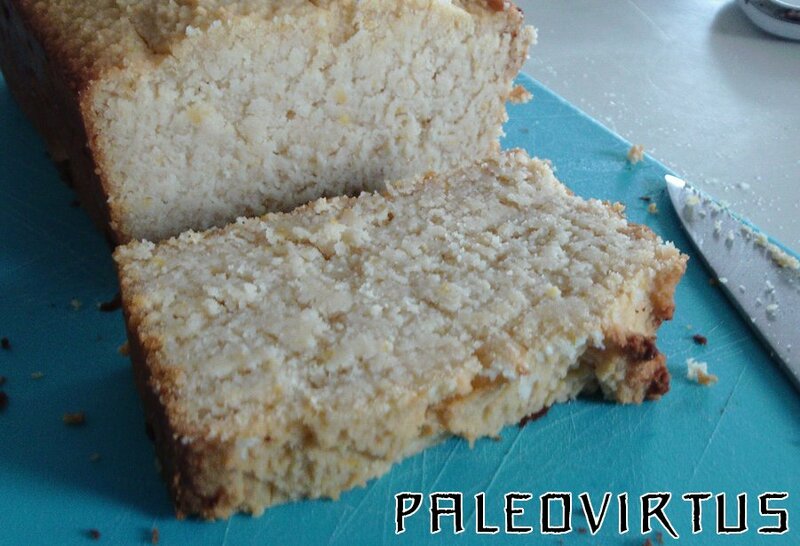 This entry was posted in Food Diary, Recipes and tagged baking, banana, cookies, dessicated coconut, paleo, recipe on September 25, 2014 by paleovirtus. This ultra-simple dessert earned its name because like a bruise it’s black, blue, and red. The tart taste of the berries with lemon juice works well in a sweet-and-sour kind of a way with the coconut. Rinse the berries. Place in a serving bowl. Squeeze a dash of fresh lemon juice over the berries. Mix well. Drizzle over coconut milk to taste. Sprinkle over a generous dusting of dessicated coconut. Serve. 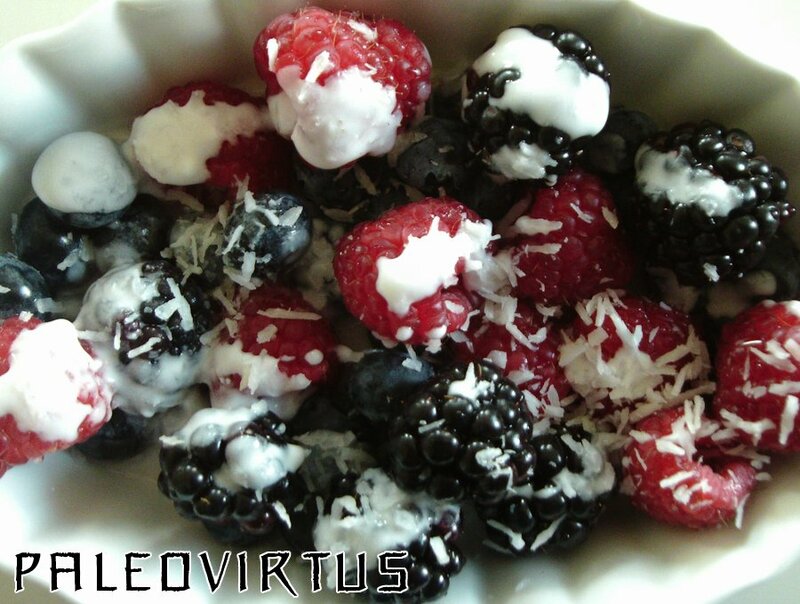 This entry was posted in Food Diary, Recipes and tagged blackberries, blueberries, coconut milk, dessert, dessicated coconut, paleo, quick, raspberries, recipe on September 24, 2014 by paleovirtus.